What is Mindful Nature Walk? Nature Walk is taking a walk with your child; however, he pretends he is walking in the wilderness. While on the walk your child will notice all the wildlife on the walk. The goal is to notice as many details about the birds, insects and other animals as they can. Giving your child a magnifying glass or binoculars really allows them to see bugs and birds up close and notice details they may have missed in the past. 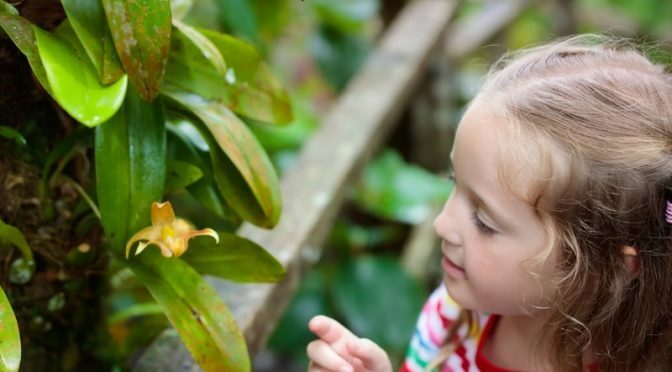 Nature Walk builds visual memory and visual observation skills. It helps children focus their attention and concentrate.Wildlife walk promotes mindful awareness and mindful movement. Let’s go on a wildlife walk! As we walk through the wilderness we want to remain quiet and mindful. We will walk slowly so we don’t miss anything. Turn your senses on high and notice all the birds, bugs and wildlife that you can. Remember we are always kind to our environment. Just notice the wildlife, don’t interact with it. Use your magnifying glass or binoculars to watch the wildlife in silence and notice what it sounds like, how it moves, and what colors you see. Want to learn more? Join us for our kid’s yoga and mindfulness teacher training this summer!